As the iPhone becomes even more mainstream (if that’s even possible), more people are using their phone to manage their files and documents on the go. If you happen to be one of those people who use their iPhone to do everything on the road, you are going to need a tool that enables you to share items from your apps with other devices (e.g. PC, Mac, iPod, …). ClipPrinter is an innovative app that lets you do that and more. 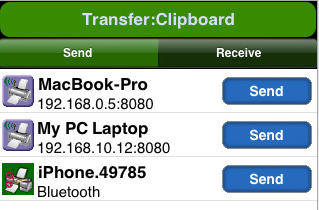 ClipPrinter makes it easy to transfer items from your device to other iPhones through WiFi and Bluetooth. You can also use your WiFi connection to send files to your PC or Mac. ClipPrinter can also manage your clipboard as well. You can copy and print emails, calendars, text messages, and maps with the app. ClipPrinter not only allows you to send files to your Mac/PC or other iPhones easily, it can also accept files from your Mac and PC as well. So you can share your files across your devices easily. You can print your documents through your Mac/PC as long as you have a network connection available. You can also send clips via e-mail as well. All in all, ClipPrinter is a complete file management solution for iPhone that not only lets you share files among your computers and other devices, but it also manages your files and lets you view them on your phone as well. If you are constantly on the go, you are going to need ClipPrinter.